Need an immediate escape from our pre-Gilead society? Want to cocoon yourself up into a liberal bubble of Broadway? Right now, there are five shows running in NYC that are woke as hell and worth your support and adoration. Some break ground by having non-binary or trans characters as an integral part of the show, and some force us to look at race and politics and how we can step up and make change. The new Go-Go’s musical is subversive, fun, and unabashedly queer. Beyond featuring first trans principal performance from Drag Race’s queen of the lipsync Peppermint, at the center of this musical is a modern, progressive discussion about gender fluidity. There’s the non-binary Pythio the soothsayer, there’s a lesbian princess who falls in love with her handmaid, and there’s an interesting subplot involving the leading man in drag and how he attracts the other characters and finds a new part of himself through his experience living as a woman. Go for the Go-Go’s songs and stay for the incredibly affirming celebration of LGBT culture. The musical about two dreamers who crash and burn under the lights of Studio 54 is a little camp, but like all good cult musicals (which this surely will become in time!) it soars by spotlighting those living on the fringes of society. There’s a single African American mom who secretly cuts herself, there’s the gay go-go boy who survives by selling himself to men, and a lesbian couple who adjusts to one of the partners coming out as trans and living his life as a man. The show doesn’t let any of these big revelations rock the boat too hard—they are just matter of fact to these people’s existence, a completely normalized bullet point in their biographies. You might not think a play called Straight White Men is going to be woke, but hell if this isn’t 90 minutes of joy for the NYT-subscriber set. The first play to be produced on Broadway by an Asian woman, the titular white guys are very much under the thumb of the show’s two non-binary narrators, the iconic Kate Bornstein and the two-spirited newcomer Ty Defoe. The show opens with the brothers playing an adjusted game of Monopoly called Privilege, which their liberal mother made for them as children to be cognizant of their own white male privilege at a young age. There are so many two-and-a-half-hour shows you wish were 90 solid minutes, but this 90-minute comedy I would have watched for two and a half hours easily. Save the eye roll because this adaptation of the cartoon is taking on serious issues in our society in a fun, colorful way. Bikini Bottom is facing imminent annihilation (like nuclear war, but not), and we watch how this microcosm handles that. The government and the media turn against each other viciously, with a corrupt politician asking citizens not to believe the terrible reality in front of them. Sandy Cheeks (played by an African American woman) is a squirrel who makes her home in the ocean, and her otherness (which was celebrated before) is used to make her a scapegoat for the impending doom. SpongeBob uses his privilege (as an actual sea creature) to speak up for his friend and help others realize that Sandy is an asset to their community and not a detriment. See it’s SpongeBoB but it’s deep. No one needs me to espouse the virtues of the Tony and Pulitzer Prize-winning Kennedy Centers Honoree. 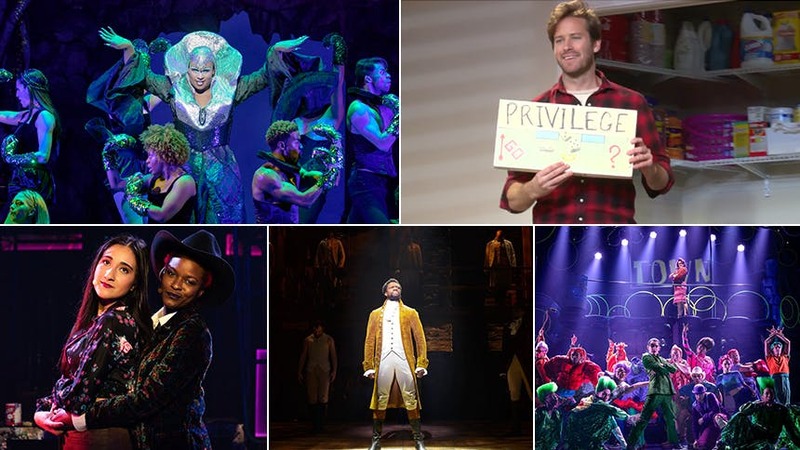 The blockbuster musical led the charge in this new era of commercial theatre, and it remains a beacon for the politically savvy.